Woven or knitted, textiles link the diverse disciplines and departments that make up FIT, from fashion (fabric) to painting (canvas). Hence, the theme of textiles informed our entry to an invited competition for a new interdepartmental classroom building at the Fashion Institute of Technology. Our well-dressed building is clad in an ensemble of materials – woven glass on the exterior and gold carpeting and upholstery on the interior – to weave together a series of interactive spaces for the FIT community. From the soaring street-level atrium to the administrative roof terrace, this golden “thread” defines a continuous circulation path through the building, activated along its length by multipurpose student activity zones. The project is fully sustainable, featuring natural ventilation, daylight, and green roofs, all aimed at improving quality of life while increasing energy efficiency. The building’s unique cladding creates a breathable membrane that shields the building from the elements while permitting it to draw energy and air directly from the outside environment. As the first ‘green’ residential high-rise in the United States, the Solaire building has introduced a new intercon­nection between architecture, its urban setting, and landscape in sustainable design. Balmori Associates col­laborated with the design architects, Cesar Pelli & Associates, to incorporate ecologically beneficial green roofs and a hydrological system into the infrastructure of the building. Balmori Associates employed two types of green roofs for Solaire: an extensive vegetated roof, or a covering of groundcovers and sedums in 4” of growing medium; and an intensive green roof, which has deeper planting beds for a variety of vegetation ranging from perennials to bamboo trees. Located on the 19th floor, the inten­sively planted rooftop provides outdoor public space for the residents of the building, high above the city. There are many ecological benefits to the inclusion of the greens roofs. They absorb solar heat which in turn lowers the building’s temperature, saving energy, and helping to mitigate the urban heat island effect. Rainwater is absorbed by the vegetation, reducing the amount of storm water entering the municipal system, and is cleaned of heavy metals and pollution in the process. The excess run-off is collected in a basement cistern, along with the building’s grey water, and is later used to irrigate the green roofs as necessary and is channelled to nearby parks. Balmori Associates was given a 2004 Green Roof Award of Excellence for their design by Green Roofs for Healthy Cities. The Solaire was the first building to be designed in response to an ambitious set of new guide­lines for green architecture developed by the Battery Park City Authority. It has been awarded a Gold Leed Rating and received New York State’s Green Building Tax Credit. In 2002, Solaire was one of five projects selected by the United States Department of Energy to represent the nation at the International Green Building Challenge in Oslo, Norway. This proposal developed as a result of a presentation given by Diana Balmori in June of 2002 at a conference entitled Case Studies of Greens in New York City. The network of elevated trains and roadways overhead provides a panoramic view of the 11.7 million square feet of rooftops (belonging mainly to one-story industrial buildings). 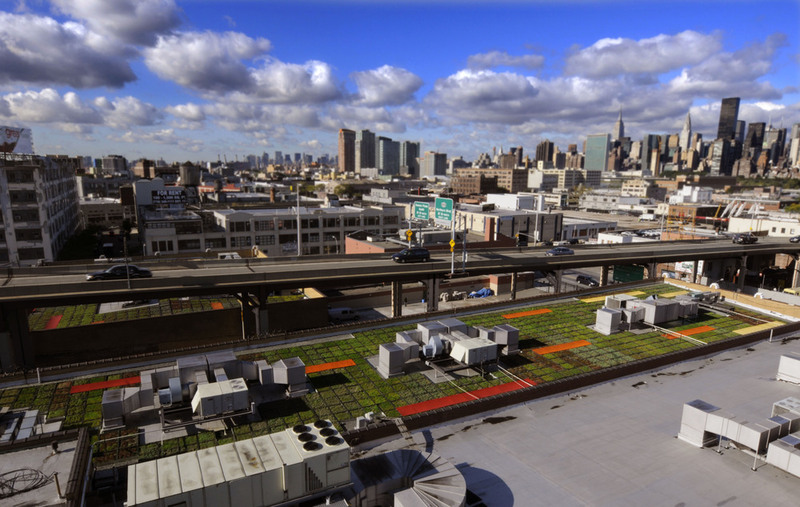 Expected benefits from the Silvercup green roof—which is equal parts roof garden, insulation system, and sponge—include absorption of air pollutants and carbon dioxide; improved outdoor air quality; increased energy efficiency and storm water run-off reduction (a particular burden to the sewer infrastructure of Long Island City); and, for the first time in New York, the gathering of data to quantify benefits. EarthPledge, a non-profit organization devoted to identifying and promoting technologies for sustainability, has installed the Silvercup roof research station. Temporary memorials arose as a way for both city residents and visitors to respond immediately to the events of September 11th --areas for grieving sprang up on fences, traffic islands in downtown Manhattan and fire stations throughout the city. While the pairing of the terms ‘temporary’ and ‘memorial’ is seemingly contradictory, this juxtaposition adds a certain resolution that exists for a fixed period in time. Balmori Associate’s viewing wall for Ground Zero looks to those spontaneous, short-lived responses as a way to capture a specific moment of our grief. Ground Zero’s perimeter enclosure was imminent, as the Port Authority announced plans for a 40-foot long fence around the site; as a response, Balmori Associates generated ideas for the enclosure, presenting them in model form at a meeting of the American Society of Landscape Architects at the Max Protetch gallery. The proposal was sent to the Lower Manhattan Development Corporation (LMDC) and the Port Authority developed an alternate plan based on Balmori Associates’ design. New York New Visions, a committee of design professionals concerned with the rebuilding effort, further revised the proposal during a weekend charrette. The Port Authority then produced construction documents, modifying our suggestions but keeping our original idea of transparency and setbacks. The final viewing wall was 13 feet high with 5-foot setbacks where visitors were able to leave mementos to be collected on a regular basis. The structure is also a sort of construction fence-a regular feature at every construction site in the city since John D. Rockefeller put one specifically designed for viewing the construction of Rockefeller Center in the 1930s- an acknowledgement of the public’s legitimate inclusion in urban development. The name of the structure changed from “construction fence” to “perimeter enclosure” and then to “viewing wall” to reflect an awareness of its public role. The idea for this west village townhouse was to create layers of landscape on multiple surfaces, both horizontal and vertical. The architecture steps down in the back to allow maximum levels of sunlight into the house, allowing for terraced gardens at each level. The top garden is a private garden off of the master bathroom, which floats in a field of grasses. The middle terrace is an entertainment garden with a screen of bamboo and a wood platform event space. Spilling from the kitchen, the first level terrace has a grand ‘moss painting’ of granite and moss, and is stitched together by an indoor/outdoor koi pond for all seasons. The facade is wrapped in planting, using a screen of plantings to create a bold play of the interface between architecture and landscape.